(a) The AUTO switch allows selection of the compass display. (a) Because each vehicle has its own magnetic field, calibration should be performed. The calibration function is used to compensate for the residual magnetism of the vehicle. (a) The compass or vehicle may become magnetized while the vehicle is being shipped. As a result, it is necessary to perform calibration for the compass before the vehicle is delivered to the customer. If calibration cannot be performed successfully (calibration cannot be completed in spite of driving around several times), it may caused by excessive magnetization of the vehicle. Demagnetize the vehicle using a demagnetizer and perform calibration again. 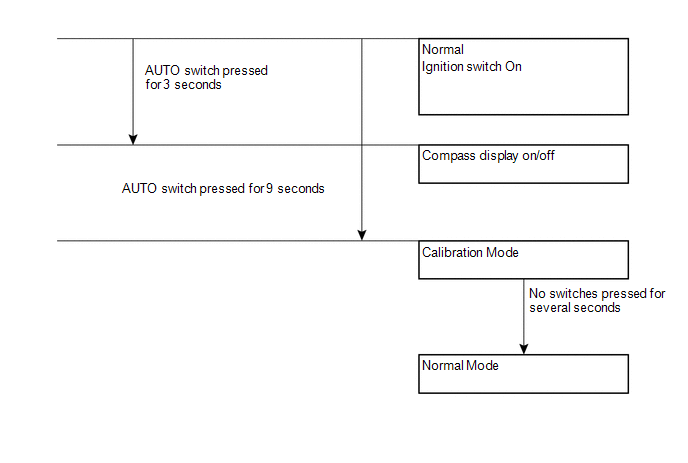 (a) When the compass is in normal mode, pressing the AUTO switch for 9 seconds will activate the calibration mode. (b) Drive the vehicle in a circle at a speed of 8 km/h (5 mph) or less. (c) After driving around in a circle 1 to 3 times, the direction (N, NE, E, SE, S, SW, W or NW) will be displayed on the compass display. This indicates that calibration has finished. After calibration is performed, it is not necessary to repeat the calibration procedure unless magnetic field of the vehicle changes drastically. If the magnetic field changes drastically, the compass display will indicate "C".